Year after year, God has used generous people to help fund and fuel the ministry efforts of Battle Cry. Battle Cry Ministries is a faith based, 501 C3 ministry, which has operated on a conservative budget for the past eleven years. We have been richly blessed by the selfless hearts of our donors and take seriously the responsibility of Godly stewardship with every penny that comes our way. We are set up to receive contributions in one of two ways, by check (payable to BCM) to our mailing address or through our secured online PayPal account. This page has been specifically established to allow funds to be designated for the salary and ministry expenses of Jade Allison. If you send in a payment through the mail, please write 'Jade' in the memo. If you send a payment through PayPal, please enter 'Jade' in the special instructions module. 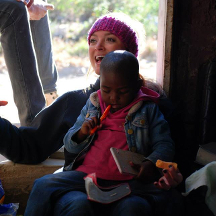 I have been in South Africa for 4 YEARS doing ministry and loving every second of it. God has worked in and through me in an unbelievable way! When I stepped out and let God lead me and bring me on this amazing journey, I NEVER realized the good and quite frankly, the bad that came with ministry and mission work. You see and experience so many different life styles, cultures, people, situations, partnerships and encounters, both beautiful and ugly. I would love to say my journey has been nothing but butterflies and flowers, but the world is hard and it is rough and mission work is hard and it is rough. But it’s beautiful and so worth all the heart ache and suffering that you experience. I’ve seen God work in my life and change other people’s lives more in the three years of complete surrender to Him than I have seen my entire life. I’ve completely given my life to Him and let Him guide each and every step. I praise Him for allowing me to be a vessel of His word, a light to this world, His hands and feet. I’m thankful, grateful and honored to proclaim His name and to call Him Father and King. I’m beyond thankful that I have been able to live for Him and do His work for the last three years of my life in South Africa. My heart has been transformed and changed forever. I’ve seen lives changed and hearts so hard become so soft and beautiful because of Jesus forever living in their heart and changing their view of life. What I have been able to accomplish in Jesus’s name the last few years is actually really hard to put into words, because it’s been overwhelmingly amazing. It reminds me of when you see a beautiful view in person and you say, “Ah, I have to take a picture of this, so I’m able to show people how beautiful this is.” and then you take the picture and it doesn’t do the view justice whatsoever. That’s how I feel when I try and explain Africa and what these last three years have been filled with. What I can tell you is that I’m excited and overjoyed with what God has done and is CONTINUING to do. I believe with all my heart that this year He’s going to blow my mind even more with what He has set before me. Walking side by side with my forever King is the only way I can imagine to walk. Please be praying for me and for this upcoming year in Africa. Get ya’ some popcorn and stay tuned to what God has in store! It’s going to be a year full of beautiful encounters, lives changed for The King, people growing in their walk with Christ, and life being lived to the fullest because life with Christ is abundant. So, here’s to a year of beautiful things! Thank you all for your love, support, and prayers. In addition to God’s divine grace, your partnership has gotten me through three years of an amazing journey. If you feel led to help me make this year happen in South Africa, its just a click away. Any support is greatly appreciated!